Bray went into Friday's game with four straight defeats. BOHEMIANS REMAIN ONE point behind Bray Wanderers in the Premier Division following a dour 0-0 draw with the Seagulls in Dalymount Park on Friday night. The Gypsies were riding the crest of a wave following successive wins against rivals Shamrock Rovers, a first win in Tallaght since 2012, and league leaders Cork City in what was the very first league defeat the champions-elect have suffered all year. With this incredible turnaround, following on from the previous month which included three straight defeats, Bohemians went into Friday’s game with the prospect of European football giddily rolling around the back of their minds. It would be an incredible turnaround for a side which faced the prospect of being dragged back into the relegation battle to make the top three, but with the faltering of Bray in recent weeks added to by their deconstruction of Rovers, it seemed anything was possible. All of this optimism and hope for what lay ahead in the closing stages of the season was sucked out in this game, however. An electric atmosphere was present in Tallaght seven days ago and the win against Cork an incredible feat. 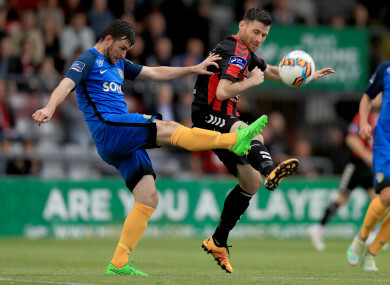 But Bohemians failed to bring that energy and determination into Friday, with both sides’ defences reigning supreme on a game which presented few chances and failed to inspire. A quick one-two between Jason Marks and Ryan Brennan saw the former let off a shot from just inside the area, however the effort was heroically blocked down by Dan Byrne. Set-piece specialist Lorcan Fitzgerald was presented a decent opportunity with a free-kick twenty yards from goal, however it simply dragged along the surface before hitting the bottom of the Bray wall. At the other end Marks offered some zest in the final third, with the forward deflecting a John Sullivan effort into Shane Supple’s opposite corner, however the Bohs shot stopper saved comfortably as the ball bobbled into his arms harmlessly. The game’s closest chance came after the interval when a Mark Salmon cross met Brennan at the far post. The Drogheda native turned his body well to execute a fine effort on goal from no more than three yards out, however goalkeeper Supple reacted quickly to close down the space early and suffocate the shot at its root. Keith Long may have been worried when striker Ismahil Akinade went down injured with just under half an hour to go. The striker scored a blistering effort in last week’s Dublin derby and assisted Dinny Corcoran’s winner too, however a collision with Bray goalkeeper Lee Steacy along with defender Tim Clancy saw the forward receive medical attention. A promising chance looked on the cards for Akinade following a pinpoint ball over the top from Oscar Brennan, however the ensuing collision saw the chance scuppered, with the Bohs striker eventually getting back to his feet to the applause of the home supporters. The introduction of Keith Ward and Paddy Kavanagh reignited some energy for the hosts, and with Shamrock Rovers then trailing against Derry on the night an opportunity was presenting itself to go level on points with the Hoops should Keith Long’s side grab a late winner. Rob Cornwall almost looked to have done just that and stolen all three points from a Bray side who had conceivably done enough to earn a point, but his storming header from Fuad Sule’s cross rose just over the crossbar to keep it a stalemate. Email “Gypsies winning streak comes to a close as Bray frustrate during lacklustre stalemate ”. Feedback on “Gypsies winning streak comes to a close as Bray frustrate during lacklustre stalemate ”.